The quickest, easiest way to remove the nine obstacles and banish their five unpleasant companions is to focus on the only object that never changes. Disease; mental inaction; doubt; carelessness; laziness; inability to withdraw, compose, and rest; hallucination; inability to reach, grasp, or comprehend the goal; and inability to remain grounded are the obstacles—these are distractions to the mind. Thus, vyādhi refers to mental ailment; mental illness; a condition totally opposite to samādhi; the condition of mind preventing an aspirant from reaching samādhi. Together, avirati means inability to maintain the state of mind free from sense cravings; inability to withdraw one’s mind from lustful feelings; failure to maintain a dispassionate state. Thus, bhrāntidarśana means a false or distorted perception of objects or events with a compelling sense of their reality. Thus, alabdhabhūmikatva is the inability to touch the goal; inability to comprehend the goal; inability to know the context of one’s practice; inability to put one’s practice in the right context; inability to know the real meaning and purpose of the practice. In this sutra, Patanjali states an unpleasant but inescapable truth—an aspirant who is not joined or yoked in japa is bound to face one or more of these obstacles. No matter how sincere and punctual you are, your practice is occasionally interrupted by sickness and procrastination. Often doubt shakes your conviction and you wonder, Am I doing the right practice? Am I on the right path? How do I know that I am not making a mistake? Even one who is endowed with the highest degree of resilience becomes careless or negligent. Who among us has remained completely unaffected by the charms and temptations of the world? Hallucination (mistaking the unreal for the real), along with our prejudices, preoccupations, and preconceived notices, makes us unreasonably judgmental, and thus we go on persecuting ourselves and others. Self-condemnation, guilt, alienation from ourselves and others—all of which drain enormous amounts of energy—evolve from a distorted understanding of reality. Further, the inability to comprehend or reach the goal, and the inability to remain grounded, disrupt the continuity of our practice. As long as these nine obstacles persist, we exhaust our energies attempting to get rid of them, and there is little time left for actual practice. If the ultimate cure for these nine obstacles—infusing one’s life with God-consciousness through complete absorption in japa—is not obtained, then five more obstacles inevitably arise. These are discussed in the next sutra. Pain; mental agitation; trembling or shakiness of limbs; (abnormal or disturbed) inhalation and exhalation all arise with the aforementioned obstacles. Thus, duḥkha means bad space, dirty space, or space both physically and mentally filled with undesirable impurities and waste matter; most commonly translated as pain and suffering. Thus, vikṣepasahabhuvaḥ means the conditions that accompany distraction. 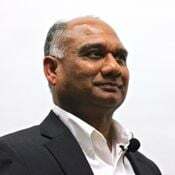 No matter what you do, according to Patanjali, when you encounter even one of the nine obstacles you will be confronted with five further conditions: pain, mental agitation, trembling of limbs, and abnormal inhalation and exhalation. Pain is a condition whose very presence demands removal. It may be physical, mental, or spiritual. Once you are struck by disease, for example, you cannot regain your repose until the disease is cured. No matter how sincere you are, you cannot put your whole mind into your practice because it will be repeatedly distracted by the pain of disease. The desire for spiritual awakening compels you to do the practice but the distraction caused by pain doesn’t allow you to attend to your practice without interruption. Consequently, you become agitated. You become angry at yourself and angry with those you could possibly hold responsible for disrupting your practice. Thus, mental agitation is the ground for anger. If the anger is not quelled, it goes on searching for a focus. In this way, anger breeds animosity. A person filled with animosity manufactures his or her own enemies. Mental agitation makes your limbs and organs quiver. That, in turn, disrupts the deep and smooth flow of your breath, and it becomes noisy, shallow, and jerky. As your mental agitation deepens, you begin to create a pause between your inhalation and your exhalation, creating the conditions that disturb the normal beating of your heart. By the time this chain of events is completed—and one leads to the next very quickly—the natural balance of our body is thrown off. The mind, which uses the body as a tool to materialize its aspirations, suffers from frustration and hopelessness. The soul, too, feels lost. That is why the great sage Vyasa, commenting on this sutra, says that the ninefold obstacles described in sutra 1.30 inevitably result in threefold suffering: physical, mental, and spiritual. The quickest and easiest way to remove the nine obstacles and the five conditions accompanying them is described in the next sutra. Meditation on one single truth is the way to overcome those obstacles. 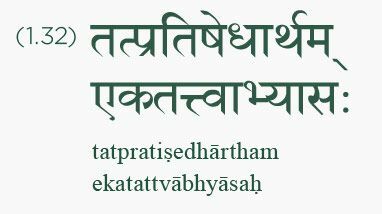 Thus, ekatattvābhyāsaḥ is the practice of one single reality; practice pertaining to only one truth. Here, Patanjali is reinforcing the idea of embracing God through a prolonged, uninterrupted practice of japa. It is important to remember that Patanjali has a very concrete idea of practice. According to him, practice means making an effort to stay “there.” “There” means the realm of consciousness where truth, the absolute reality, resides in its pristine form. Elaborating on Patanjali’s intent, the commentator Vyasa makes an emphatic statement that continuous, uninterrupted practice that allows the mind to remain focused on the eternal and never-changing reality is the way to make the mind stable. The commentator makes sure that as practitioners we understand that we can never, ever cultivate a one-pointed mind by focusing it on objects that are not stable in themselves. There is no object in this world that can be used as a focal point for meditation, for every object, as well as the perception of these objects, is in constant flux. Therefore, meditation on such objects can never make the mind one-pointed nor can such meditation make the mind become truly inward-oriented. This also means—and Vyasa is very explicit on this point—that focusing the mind on ever-flowing thought constructs is detrimental to meditation. Thoughts are never-ending and always flow outward. Focusing the mind on your thought processes means letting yourself float forever; ultimately, you will reach somewhere far away from your inner core. The intrinsic characteristic of the object of meditation has an effect on the mind. The intrinsic characteristic of God is freedom from all afflictions, karmas, and fruits of karmas; God contains the unsurpassed seed of omniscience. That is why focusing your mind on God will eventually make you free from all afflictions, karmas, and the fruits of karmas, and omniscient wisdom will begin to seep into your mindfield. In this sutra, both Patanjali and the commentator Vyasa make an extra effort to warn students about what is and is not meditation, what is practice and what is not practice. According to them, the practice that enables you to gain inner stability, that takes you inside, that introduces you to yourself, that eliminates all obstacles, and finally, that makes you see and embrace the truth directly—that alone is practice. The most straightforward and effective among all practices—that which enables you to withdraw your mind from trivial concerns and fill it with the light of the inner being—is japa, provided it is practiced in conjunction with all the prerequisites and precautions.